Brick and siding, Palladian windows and multiple gable pitches beautifully blend in this house plan's attractive exterior. With a convenient courtyard-entry garage, this home promotes easy living. The master suite is equally as stunning in that it features a tray ceiling and luxurious master bath. A corner shower, corner tub, twin vanities, private privy and two walk-in closets combine to give the home planfor a truly pampering suite. The secondary bedrooms share a full bath and the rear bedroom as access to the deck. 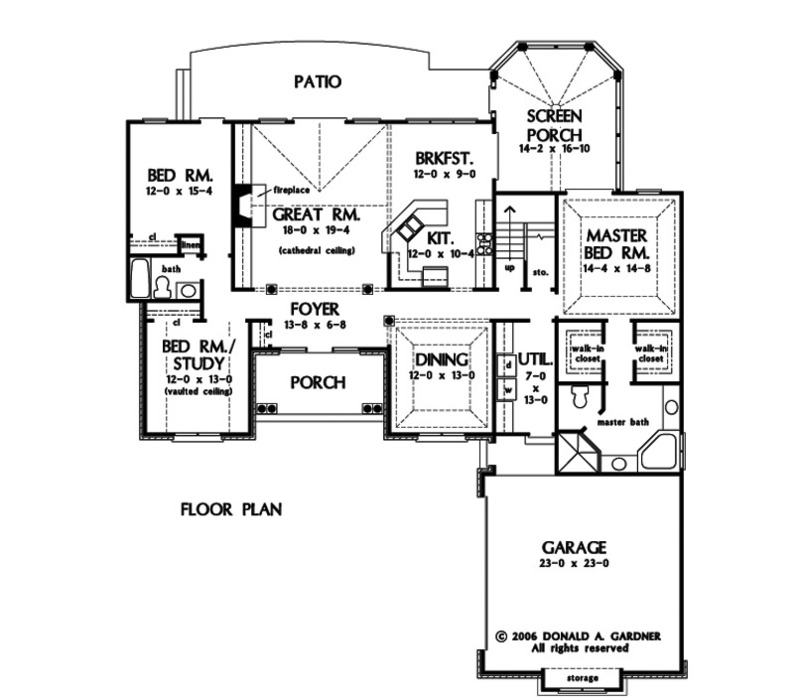 Entertaining is simplified by the open- layout floor plan. Open to the breakfast room and great room, the kitchen includes an angled serving bar that is the only partition between the rooms. A tray ceiling crowns the dining room, granting additional luxury to this formal space. 1st Floor: 2148 Sq. Ft. Bonus Room: 667 Sq. Ft.
Porch - Screened: 231 Sq. Ft.
House Dimensions: 65' 4" x 76' 9"
Great Room: 18' 0" x 19' 2"
Master Bedroom: 14' 4" x 14' 8"
Bedroom #3 : 12' 0" x 13' 4" x 9' 0"
Bedroom / Study (Vaulted): 12' 0" x 13' 0" x 12' 0"
Bonus Room : 14' 0" x 23' 0" x 9' 0"
Breakfast Room : 12' 0" x 9' 0" x 9' 0"
Deck / Patio : 35' 4" x 9' 4" x 0' 0"
Dining Room (Tray): 12' 0" x 13' 0" x 10' 6"
Foyer : 13' 8" x 6' 8" x 9' 0"
Great Room (Cathedral): 18' 0" x 19' 2" x 17' 8"
Kitchen : 12' 0" x 10' 4" x 9' 0"
Master Bedroom (Tray): 14' 4" x 14' 8" x 10' 6"
Other : 7' 0" x 5' 0" x 0' 0"
Porch - Front : 15' 1" x 7' 0" x 9' 0"
Porch - Screen : 14' 2" x 16' 10" x 9' 0"
Storage (Other) : 3' 0" x 8' 10" x 0' 0"
Utility Room : 7' 0" x 13' 0" x 9' 0"